(Nanowerk News) Small magnetic whirls may revolutionize future data storage and information processing if they can be moved rapidly and reliably in small structures. A team of scientists of Johannes Gutenberg University Mainz (JGU) and TU Berlin, together with colleagues from the Netherlands and Switzerland, has now been able to investigate the dynamics of these whirls experimentally. The skyrmions, as these tiny whirls are called after the British nuclear physicist Tony Skyrme, follow a complex trajectory and even continue to move after the external excitation is switched off. This effect will be especially important when one wants to move a skyrmion to a selected position as necessary in a future memory device. This research was published in the journal Nature Physics ("Dynamics and inertia of skyrmionic spin structures") with a student of the Graduate School of Excellence Materials Science in Mainz (MAINZ) as the first author. Skyrmions are small whirls in the magnetization of magnetic materials. In the case of the present work, the skyrmions have a diameter of less than 100 nanometers. This corresponds roughly to a thousandth of a hair width. 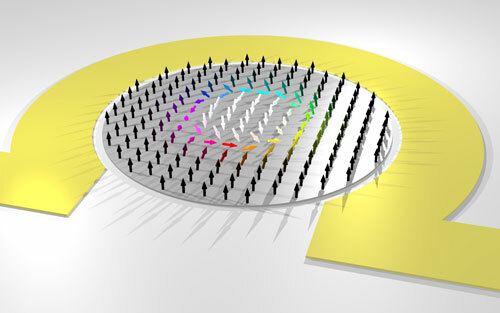 To prepare these skyrmions, scientists at Mainz University prepared small magnetic discs. "When we apply a specific external magnetic field, the magnetization in these discs creates whirls," said Dr. Benjamin Krüger working in the group of Professor Mathias Kläui at the Institute of Physics at JGU. These skyrmions were then excited by a magnetic field pulse to trace their motion. The scientists were now able to experimentally investigate the dynamics of these structures on short time scales for the first time. For these investigations, a holographic measurement setup using short and highly energetic X-ray pulses was used. This technique, which was developed at TU Berlin, can take images with a temporal separation of less than a nanosecond. The position of the whirl can be determined from these images to be compared with theoretical calculations. "The measurements show that the skyrmions move on a very complex trajectory, a so- called hypo-cycloid," says Krüger. The fact that the skyrmions move on such a curved trajectory means that they must possess some inertia. This is comparable to a car that continues to move, even though the gas pedal is no longer pressed. The inertia of the skyrmion stems from the fact that the whirl can deform. In this way it is able to store energy; after the excitation has stopped, this energy leads to a continuation of the motion. "This effect has not been taken into account up to now, but it is important for the development of small magnetic memories," explained Professor Mathias Kläui. "This effect has to be taken into account to enable the distinct positioning of the skyrmion in the memory." Skyrmions may be important for the future of magnetic data storage and information processing. These whirls can be moved rapidly and reliably along nanowires or other structures in future memories. Such a memory would retain its information even when the power is switched off. In addition, it would not need to contain any moving parts, such as a read and write head in a hard disk drive. A comparison with computer simulations at Mainz University showed that the type of motion depends a little on the shape of the disk in which the whirl is formed. In addition, there is only a small dependence on defects in the material. There is, however, a substantial dependence on the shape of the whirl, its so-called topology. This implies that the present findings can be extended to all skyrmions with the same topology. "I am happy about the good collaboration with our colleagues and about the fact that the experimental measurements, as well as the theory, were done by members of the JGU Institute of Physics and the MAINZ Graduate School of Excellence together," Kläui added. Funding of the Graduate School Materials Science in Mainz was approved in the Excellence Initiative of the German federal and state governments in 2007 and was prolonged by an additional five years in the second round of the initiative in June 2012. MAINZ combines work groups from Johannes Gutenberg University Mainz (JGU), the University of Kaiserslautern, and the Max Planck Institute for Polymer Research in Mainz. One of its research focuses is spintronics, a field in which collaborations with international partners play an important role.